I thought I knew a lot of Greek history, but this trip, among other things, greatly expanded my knowledge base. Ancient Greece, especially in the 5th and 4th centuries B.C., is considered the foundation of Western civilization. These Greeks were the first to “think about thinking.” Athens is recognized as the center of this thriving culture. Aristotle and Plato were philosophical giants who first developed complete systems of philosophy. A few other city states also participated in this oasis, but not all of them. Sparta, for instance, was a military dictatorship and, in some ways, represents the blueprint for current totalitarian regimes. In the 4th century, Macedonian Greeks conquered the rest of the country and Alexander the Great began his eastern campaign to take over the rest of the known world. He swiftly extended his conquests to Asia Minor, to the original Babylon and then to Persia. By marriages to local princesses, his lieutenants established Hellenistic regimes throughout these areas that lasted for centuries. However, Alexander himself died mysteriously at age 33 in 323 B.C., in Babylon. In Greece itself, his reign did not last long. From the West, Rome conquered Greece in the 3rd and 2nd centuries B.C. 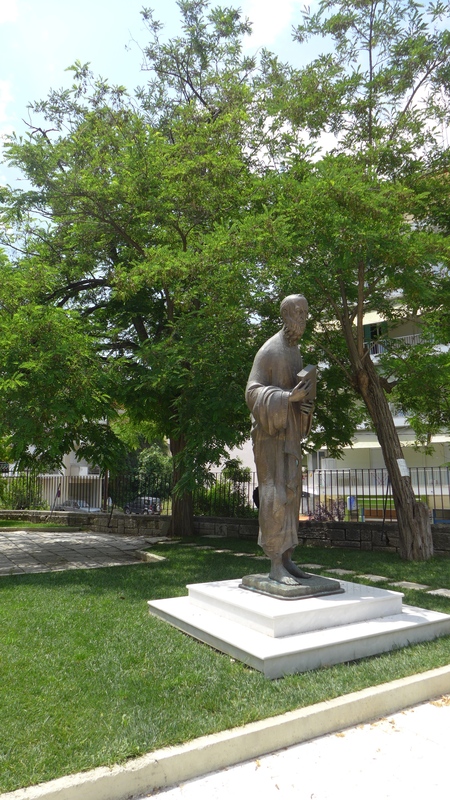 They admired many Greek writers and philosophers (although apparently not Aristotle). Greek Gods were also copied with Roman names. Centuries later, when Rome was divided, Greece was a prominent part in history of the eastern or Byzantine Orthodox Empire. Nearby Constantinople was the capital for hundreds of years. Although the Crusades were primarily aimed at Palestine, invaders from Catholic Europe did spread some havoc in Orthodox Greece. The main threat, though, soon arose from the Ottoman Muslim Turks. They gradually took over Asia Minor, the Balkans, and Greece, culminating in their conquest of Constantinople in 1453. The Turks were not unduly brutal in forcing conversions to the Muslim religion. A small number of Greeks did, since it brought some improved treatments. Several Orthodox churches moved to very small headquarters, to keep profiles as low as possible. After 1492, the Turks allowed immigration of Jews, newly expelled from Spain. In the 1820s, Greece, along with other Balkan nations, began a struggle for independence. Although the official date is 1821, the struggle to expel Turks was not completed until 1827 or so. But this newly independent nation only comprised about half of what we consider Greece today. In a later war with the Ottoman Empire, ending in 1912, Greece finally took back the northern half of Grecian territory, as well as the island of Crete. In 1922, an historic swap was completed between the two countries. Several hundred thousand citizens of each country, Muslims in Greece and Orthodox Greeks living in Asia Minor, changed locations to reside in their traditional religious environments. World War II brought a brutal Nazi invasion of Greece. Although there was fierce resistance, Nazis always responded with executions and torture. The Jewish community of Thessaloniki, some 60000+ strong, compared to about 40,000 Orthodox Greeks and 40,000 Muslims nearby, was wiped out except for about 3,000 survivors. After the War, Soviet Russia took over eastern and central Europe. Acting through its then satellite, Yugoslavia, it fomented an attempted Communist takeover of Greece (sometimes this is referred to as a “civil war”). With American aid, the Greek government put down this revolt. In the current century, amid a worldwide recession, the Greek economy was hit especially hard. Today, many Greek citizens we talked to said that independent small businessmen, as well as tourism, are keeping the economy afloat. 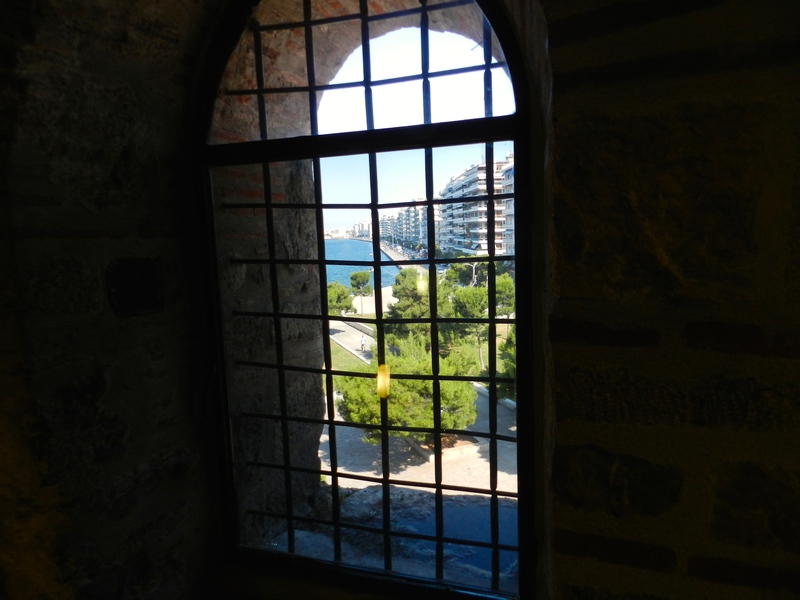 Our base for touring was Thessaloniki, the second city of the nation after Athens. This city of somewhat over one million inhabitants was once, along with Constantinople, the co-capital of the Eastern Roman Empire. The city claims to have more bars and cafés per capita than any other European city. 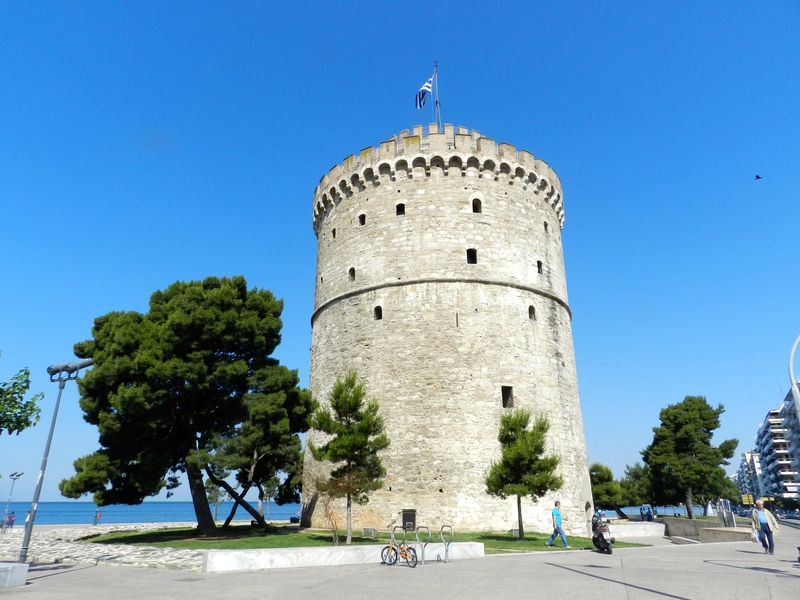 In 2015, there will be direct flights to Thessaloniki from the U.S.
We started with a walk to the White Tower, going down a long promenade along the sea. Since Thessaloniki is a college town, students make good use of this lovely walkway. The White Tower was constructed by the Ottoman Turks. Originally, it was used for executions and general intimidation of the populace, but sometimes served as a prison. Now, it is a museum that brings history to life. We toured Veria where the Apostle Paul had frequently spoken. Although Paul was a Jew, he took a Greek name and frequently toured and wrote in Greece. No doubt, he thought that Greek influence in the Roman Empire would do more to aid the spread of Christianity. Since Paul was a Roman citizen, he was exempt from the punishment of crucifixion. 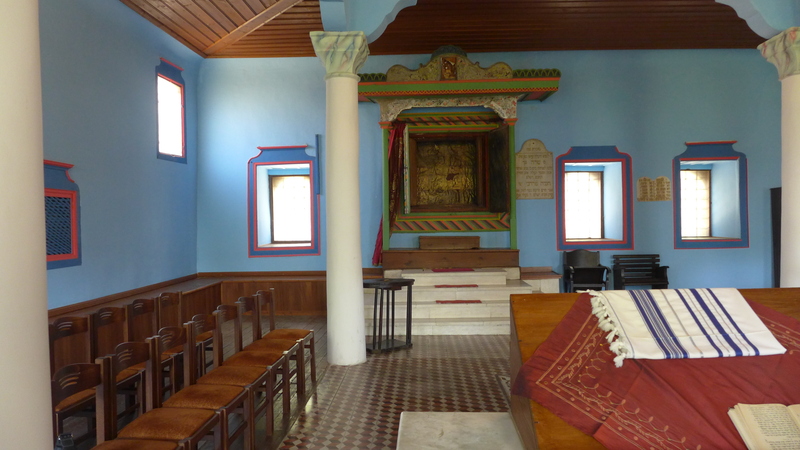 He is believed to have been executed in Rome about 67 A.D.
We toured a synagogue, where only two Jews survive. About 460 of the congregation were massacred in Nazi death camps, while about 200 managed to escape through hiding in Orthodox homes or other means. The great majority of these, 134 of the 200, emigrated to Israel after the War. Southeast of Thessaloniki in the Halkidiki region, three peninsulas are included, known as the 3 Fingers. On separate tours, one by boat and one by land, we viewed two of them. One of this duo contains a unique monastery or series of 13 monasteries, known as Mount Athos Byzantine Monasteries , UNESCO. About 2,300 Orthodox monks and some worker assistants live in these monasteries. They have an autonomous arrangement with the Greek government, perhaps similar to Vatican City governance. Monks grow their own food and wine and are very close to self-sufficient. No women at all are allowed on monastery properties. Male outsiders can visit, if an advance appointment is made and approved. The monastery started in the 5th or 6th century A.D. From 1000 to1,300 A.D., it survived numerous raids by pirates. Starting in the 15th century, it was occupied by the Ottoman Turks. 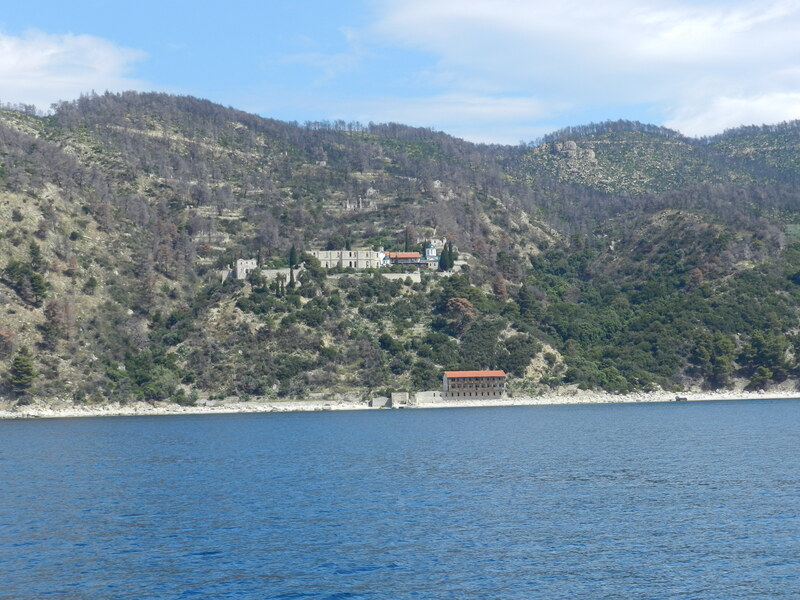 The world’s second largest church bell is supposed to be kept in Mount Athos. Also, a fragment of the original crucifixion cross is supposedly stored in one monastery. Halkidiki is known for great beaches, although we didn’t have time to try them out. All of its hotels comprise about 80,000 beds, including 16 five star organizations and 16 with a green key designation. 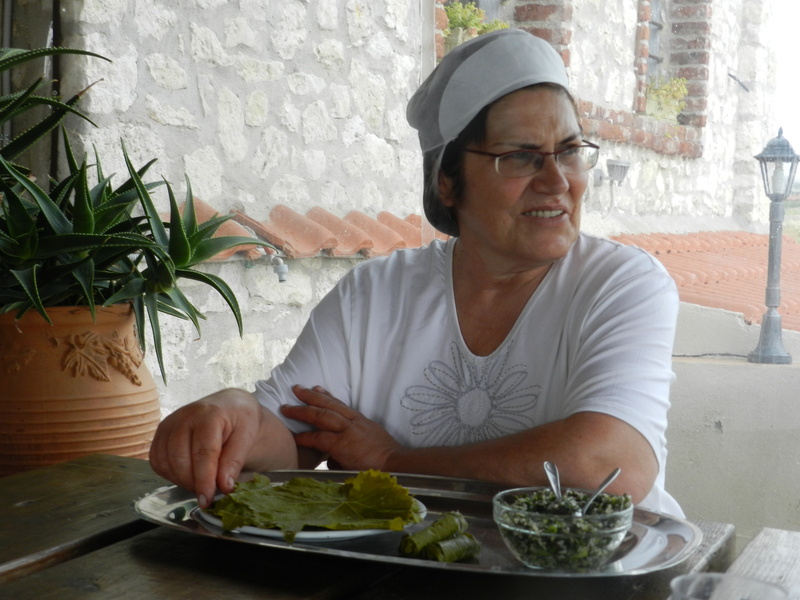 Marianna’s Products is a unique family run farm, started in 1987, that specializes in cultivating vine leaves. These come from vines growing very close to the ground. In addition to vine leaves, which account for 75% of sales, the farm develops numerous other products, such as grape vinegar, jams and marmalades, Sultana Raisins and eggplants. Oldest European Human Skull found to date. 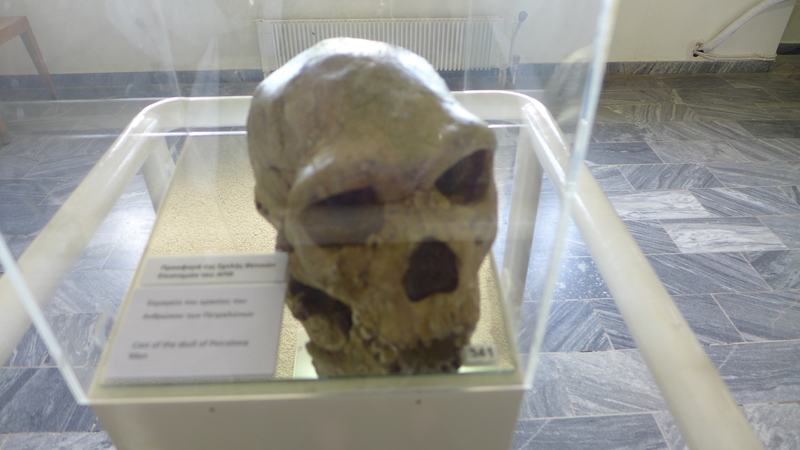 We visited Petralona cave, where the oldest human or near-human skull in Europe has been found. Dating is between 300,000 and 600,000 years old. A nearby museum provided some helpful background. Our final tour was to a very extensive dig, to visit the Vergina Museum, UNESCO monument, where the tomb and treasures of King Philip II, father of Alexander the Great, II were found. After years of search, the actual find didn’t occur until 1997. Its underground area was very well lit and contained a large set of treasures that were in excellent condition from King Phillip and his family. Through use of modern technology, the face of Philip II was restored. One side of his face was marred by an old arrow wound, from his many battles. Also, he walked with a limp. In all of our Thessaloniki hotels, we enjoyed excellent meals with lamb, cheeses and creative desserts. 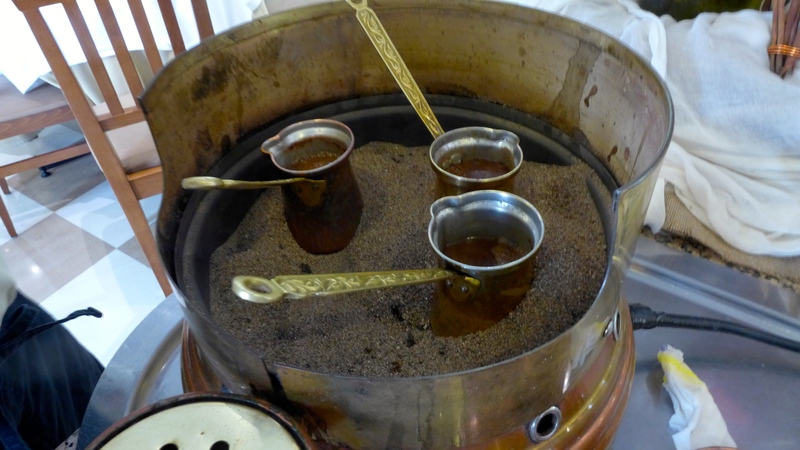 Greek wine was always served, and it too was of high quality. Meals started late for Americans, at 10 pm or later. All of the hotels we experienced were outstanding in service. Throughout our tour, we found the Greek people exceptionally friendly and pro-American. Also, almost all of them spoke English, and the few who didn’t understood had quick access to interpreters. This served to make our IFWTWA tour even more enjoyable.